The introduction of fluorescent proteins has accelerated research on GPCRs similar to that seen for many other topics in the life science field. The first fluorescent protein cloned was GFP , and it has since been widely used. The generation of color variants and variants that fluoresce as monomeric entities have been very useful in many studies and are reviewed elsewhere . Recently, additional red shifted fluorescent proteins have become available, and GFP variants useful for studying signal transduction and trafficking such as photo-activatable fluorescent proteins have been generated  . Furthermore, a tremendous amount of work has been done to improve fluorescent properties and photo stability of these fluorophores . To visualize protein-protein interactions, GFP variants have been split into two nonfluorescent proteins that upon colocalization can complement each other, resulting in a fluorescent protein complex  . Fusion of the two parts of these GFP variants to two potentially interacting proteins has been used to localize protein complexes by means of bimolecular fluorescence complementation (BiFC). The advantage of this technique is a low background since only protein complexes will fluoresce  . In the context of GPCR research, BiFC has been successfully used to study G proteins ensuring a subtype-specific combination of G protein subunits [ 12] . To detect and localize stable protein complexes, BiFC offers great sensitivity and specificity. Still, it is important to control the extent of specific BiFC signals with suitable control proteins, to exclude complex formation in the absence of specific binding. The BiFC approach reaches its limits when it comes into studying rapid dynamics of unstable protein-protein interactions due to the possible introduction of additional binding affinities. To address these questions, resonance energy transfer (RET)-based methods are superior; however, BiFC can complement a RET approach and can even be integrated into it, for instance, by function as a RET acceptor . Even though most fluorescent proteins are inferior to many small synthetic fluorophores in terms of quantum efficiency, quantum yield, and photo stability, as well as spectral properties, there are striking advantages that led to their enormous popularity. One important feature is the specificity of the fluorescence signal due to the possibility of generating fusion proteins with the protein of interest. In such cases, no unspecific labeling is expected unless the fluorescent protein is cleaved from its fused protein. No other labeling method is available that reaches such degree of specificity. The fact that by means of molecular biology the fluorescent protein can potentially be fused at any position within the protein of interest makes this method unique. Since these proteins are genetically encoded, it is also possible to generate transgenic organisms that express the fluorescent receptors as demonstrated for dopa-mine receptors  . 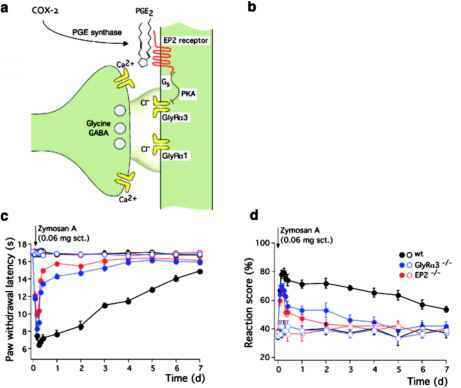 Detailed analysis of receptor trafficking in cell culture models by means of GFP-labeled receptors  have demonstrated that receptors undergo agonist-induced sequestration and internalization and subsequently either recycle back to the membrane or target to the lysosomal pathway, leading to their degradation.